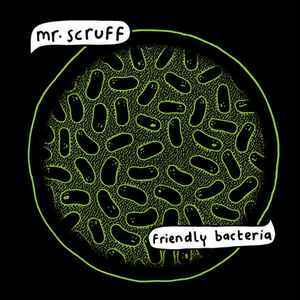 With FRIENDLY BACTERIA, Mr. Scruff, Ninja Tune staple for 15 years, begins to show his age. He brings in Denis Jones to provide vocals for the quivering funk of "Stereo Breath," the more tender edges of "Render Me," or the breathy folk-rock of "Thought to the Meaning." "Deliverance," however, stays closer to his roots of quirky, fun tracks, even if the title track has a bit more growl in its keys, set over some slinky hip-hop beats until it finally bursts open. Vanessa Freeman brings some soul to the breaks of "Come Find Me," while Robert Owens and the Chinese strings on "He Don't" bring a contemplative bent. Many of the tracks, like "Where Am I" and "What," seem to rely on the wobble synths, nearly to the point of overuse, but the deeper house rub of "We Are Coming" helps shake things up. Denis Jones reappears for the slurred jazz of "Catch Sound," but the crispness of "Feel Free" stands out much more. Perhaps the bacteria are too friendly here; I miss the days when Mr. Scruff was totally sick.